What would you do with an extra room in your home? If you have a growing family you could need the extra space with loft conversion ideas such as a bedroom, a playroom or perhaps even a study to work from. In most homes the loft is wasted space, filled with unpacked boxes and Christmas decorations. Put this room to good use and covert the darkness into a light open area to enjoy. Converting your loft will add value to your home too and as long as everything complies with Building Regulations you’ll have extra appeal that will be of interest to future potential buyers. As long as there is sufficient headroom, there shouldn’t be any problems with the loft conversion. Of course, it could be awkward depending on which way the stairs would face and whether there would need to be plumbing alterations. Roofs have changed over the years, but there are two main types – the rafter and purlin traditional style and the modern trussed. It’s generally accepted that the older style is easier to convert and properties built before the 60s incorporate this design. To make a loft conversion worthwhile you need a certain amount of headspace. The general rule of thumb seems to be a 2.3 metre headspace around the main floor area, and there’s not much point in converting if you can’t stand up. This is perhaps one of the most important aspects to converting your loft and you need to give this great consideration. The stairs will be important, in particular which way they face. Airing cupboards are often removed to accommodate this and the hot water cylinder will be moved elsewhere. Converting your loft into extra living space will add value to your home and make the most out of everything your property has to offer. If you’re interested in converting your loft, complete our quick form and receive up to four FREE quotes from local, vetted and reputable companies. 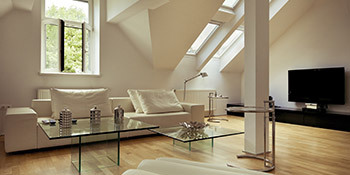 This will ensure you get the best loft conversion prices and create the ideal living space for a cheaper price. Project: I wonder how much it costs to convert the loft to two bedrooms and a shower room. Also, I wonder how long it takes. Very professional but their quote excludes quite a lot of what i would expect to be standard; such as LED spot lights rather than pendants in bedrooms!! Professional & helpful & honest advice & much appreciated. Very professional company so far. We've yet to receive a quote so we hope it is within our budget! Quotatis has been successful in bringing talented firms. Properties are given an energy rating dependent on how efficient they are and ratings are presented in the data down below. This varies from A, the most energy efficient, to G, the very least efficient. With a higher rating you're more likely to have less costly energy bills as more heat shall be kept in your house. You can enhance your home's efficiency with insulation such as upvc double glazing, loft lagging or wall cavity insulation. There are many different types of home in Britain and the data below illustrates the type of housing within Uk. Over the country the most common housing types tend to be semi-detached and terraced housing, although detached homes, flats and bungalows are also available. The information beneath offers an indication to the number of homes in Uk which are central heated and non-central heated. Properties are heated by a number of sources which indicate how pricey annual energy bills are going to be. Types of central heating include gas, electricity, oil, solid fuel and LPG boilers. Changing exactly how your house is heated can see you with cheaper bills. The data underneath reveals the spread of households warmed by various fuels. Around the UK the most common undoubtedly are gas heated properties, followed by electricity and then oil. Biomass central heating boilers are also rising in popularity, heated by renewable products like wooden pellets or agricultural waste.|Homes in Britain are warmed by a variety of fuels, such as gas, electricity, oil, solid fuel and LPG boilers. Each fuel has a varying cost associated with it and that means you could find yourself with more affordable energy bills by changing how your house is heated. Even solar thermal panels are being considered by many in order to reduce heating bills for the years to come.